Your obsession with your cell phone could lead to cell phone rage. Businessman: "Man, the traffic at this junction is really bad. I wish I had stayed home. The indicator says I will be here for 113 more seconds." Young woman to friend: "Right now, I am walking into the post office". Now I will be going in for some beer." If these are the kind of conversations you have on your cell phone, you might be joining the ranks of the cell phone dependent. The cell phone demands and you comply. Bad enough. But it is when you demand and the cell phone refuses to comply that you could fly into cell phone rage. The rage could also overcome you when you want some peace and a young woman using the cell phone at your local café refuses to comply because she is emphatically discussing the pros and cons of legalising abortion in the United States, and at the top of her voice. There are a few things you need to remember if you are trying to avoid cell phone rage or want to shake off your cell phone addiction. ~ Think of your cell phone as a tool for emergencies ("Honey, the house is on fire!") and not something that can allow you to spend every minute of your leisure time talking to someone or the other. Remember that to grow as a person, you need some time to yourself too. ~ Stop having unnecessary conversations on your cell phone to pass time. ("Hi. Anything new happening in the last hour?"). There are better ways of doing that, like reading a book for instance. ~ You do not have to take EVERY call. You have a caller ID facility and a voice mail facility. Use them. Let the person calling leave a message on your answering machine and if the message is important, call back. ~ Put your cell phone on vibrating mode to avoid disturbing others around you when it rings. ~ It's likely that the more available you make yourself, the more you will be expected to be available. So if a friend does not find you, because you could not answer his call, he is going to be bugged. Instead you should make it clear that you are not available 24/7. The best attitude: If a call is important, the caller will try again later. ~ Cell phones are not infallible, neither are cell phone service providers. If you accept this fact, you will experience less frustration when things go wrong (as they often do). ~ Keep all your cell phone bills for your record. They are very useful when you are making your case against a huge bill. Yes, it is a casual atmosphere but be sensitive to the feelings of those around you who might be trying to enjoy a peaceful evening. ~ Ask if there are any restrictions on cell phone use. ~ Put your phone on vibrate mode and answer only important calls and keep all calls brief. ~ Keep your conversation tone low to avoid disturbing others around you. Can anything be more irritating than to have a cell phone ring while you are speaking in a meeting? Well, it could be worse. The call could be answered. ~ Make sure you turn off your phone before you enter. ~ If you are expecting an all-important call, put your phone on vibrate mode or periodically check for voice mail. ~ No matter what happens, DO NOT answer any call inside the venue. Why visit a museum or a temple if the atmosphere around is worse than home. You might as well stay back and endure your wife nagging and the kids fighting and complaining. ~ Leave the potentially offensive item in the car. If someone needs to reach you, let him/her find a less intrusive way. ~ Switch off your cell phone as soon as you enter the aircraft. ~ If someone seated near you is busy talking on his/her cell phone, request him/her that they need to switch it off. If all you get in return is an imperceptible nod while the person continues to talk, bring this matter to the attention of the flight attendant. Do not communicate with a person who is in front of you with nods, shakes and furious gestures, even if it is a waiter trying to get your order. 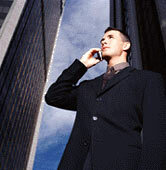 Put the person you are on the phone with on hold while you talk to a person whom you are meeting face-to-face. Do not use the cell phone while driving. Period. Ask yourself this significant question: Do I want to be available to everyone all the time? Unless you are the emergency department of a hospital, you would not want to do that. The next time your cell phone rings, check if it is convenient for you to take the call at that particular moment. If you feel forced to respond, pick it up and say, "Hi. How are you? Can I call you back later?" Disconnect, sit back and relax. Even better, turn your cell phone off and check for SMS messages at regular intervals. (Not every five minutes though). And this could even mean you won't have to answer calls from your credit card company either. Dr Roopa Nishi Viswanathan has an MBBS from KEM Hospital, Mumbai, with a Masters in Nutrition from the University of Texas at Austin.